Snowblink released their latest LP Returning Current last fall, and the indie pop duo have now given "Feel Like a Man" from that album a special video treatment. Providing an immersive virtual reality experience, the clip allows viewers get a full 360-degree view of a group of women partaking in a ritualistic gathering of food and dance. It was shot in Brooklyn last November, and with a crew that was 90 percent female, the video captures both the political fears and communal support that many felt during the week of the U.S. election. "Many of the women on the set were heartbroken, afraid, angry," Snowblink's Daniela Gesundheit explained in a statement. 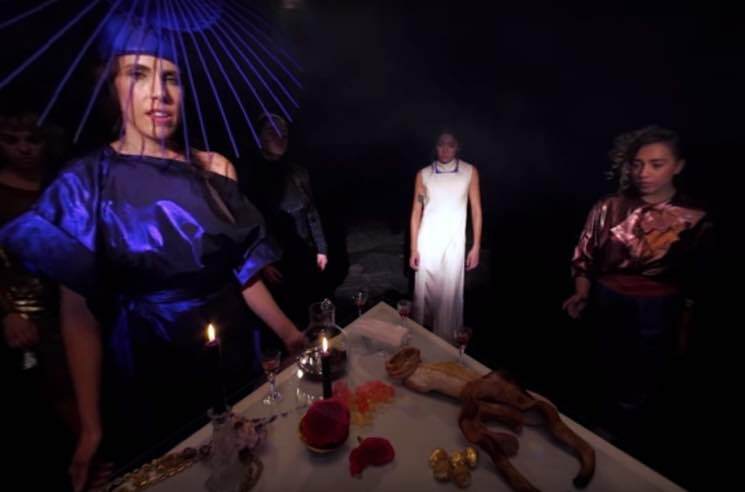 "We came together with a common purpose and created a ritual — a surrealist futuristic virtual reality seance wherein twelve dancers undergo a deep transformation over the course of a dinner banquet. With the camera positioned at the center of the banquet table, the viewer stands surrounded by these women, often encountering intense or compassionate eye contact. The piece is intimate and gives the viewer a sense of being a part of something private and transformative." The Sam Fleischner-directed clip arrives in conjunction with the band's appearance at the Marfa Myths Festival in Texas, where the video premiered. Watch it below.